Rebirth of 18th and 19th centuries classic in the harmony of the flute orchestra! The flute has extensive sound range from piccolo that goes beyond the highest range of piano with soprano, alto, base and contrabass flutes. The single group of flutes can make an orchestra. As a unique and leading flute orchestra, the selected representing symphonies and operas for audiences. It shall deliver the feeling of the 18th and 19th century classic orchestra. is designed to spread out the Korean classic and to show the excellence of flute culture in Korea. The flute orchestra is a process to communicate with authentic classic by our audiences and flautists through the modern flute. This performance consists of great symphonies and operas in the 18th and 19th century. It is a great opportunity to meet with classic masterpieces. The repertoire consists of splendid symphonies and operas in the 18th and 19th centuries. Orchestration with only flutes shall deliver a new impact of the original music. He graduated from College of Music in Hanyang University, and completed the Perfectionnement in Ecole Nationale de Musique de Gennevilliers. He meets audiences with solo and ensemble performances every year, and has spread out the flute in music seminars with history and various stories of the flute. He also arranged concerts with world renowned flautists and professors. In 2002, he launched a flute magazine “flute&”, which has helped people to appreciate Korean flute culture. Endeavoring to popularize flute orchestra, he serves the FEA Flute Orchestra, Seoul Moyse Flute Choir, Millennium Flute Choir as a conductor and musical director. Also he is a musical director of Art Space 'the Musici' sharing beauty with many. She graduated from the department of musical education in Konkuk University and studied cultural art administration at the graduate school of Ehwa University. She is widely interested in open communication with various areas with flute. She is currently working in charge of producer and project manager in Flute House.
" is designed to spread out the Korean classic and to show the excellence of flute culture in Korea. The flute orchestra is a process to communicate with authentic classic by our audiences and flautists through the modern flute. This performance consists of great symphonies and operas in the 18th and 19th century. It is a great opportunity to meet with classic masterpieces." Gloria Jee-eun Park has captivated the souls of her audience through her powerful yet graceful flute playing. Having overflowing passion for music and eminence, she has captured the essence of expressing her distinct color in music with her energetic yet elegant style. While attending Yewon School in Korea, she decided to further pursue her music studies in Juilliard pre-college. She completed her bachelor’s degree in Manhattan School of Music, followed by attaining her master’s degree in Yale School of Music with scholarship. Gloria has won many 1st prize awards in many competitions in Korea and she has built up her achievements by receiving many 1st prize awards internationally also.Gloria held numerous solo recitals and has been active performing with various orchestras. Through these diverse performances, she has gained appraisal for her dynamic and delicate qualities from other musicians. She has been known for her unique and clear interpretation of music, putting together the different colors into perfect harmony. As a soloist, chamber musician, and orchestra player, she is expanding her musical horizons. She has been selected as the youngest Principal player in the Seoul Philharmonic Orchestra at the age of 25, where she is currently affiliated with. She is also teaching at Hanyang University and mentoring many young students. She is also the Korea’s First Woodwind YAMAHA ARTIST. Handel's [Music for the Royal fireworks] is one of the two major outdoor concert music along with [Water Music Suite]. Many Europe countries including the Great Britain and France took part in the War of the Austrian Succession in mid 18th century upon the succession problem of Maris Theresa. The Great Britain was the main support of her. The Great Britain was worried about the decline of the colonial power if the French took the initiative in Europe. In fact, the War of Austrian Succession was one phase of power struggles between the great Britain and French between 1689 and 1815. The War concluded with the Treaty of Aix-la-Chapelle in October 1748, which confirmed the succession of Maria Theresa in almost whole territories though some left grounds for quarrel. The Great Britain was in a festive mood. On the 27th of April 1749, fireworks went off in Green Park in London. Handel composed [Music for the Royal fireworks] to celebrate the day, and this music was premiered prior to the fireworks of the same day. The Symphony No. 101 'The Clock' is one of three symphonies composed by Joseph Haydn during his second visit to London. The symphony belongs to the 11th symphony in Salomon set. 'The Clock' was named in the early 19th century that reminded 'ticking' rhythm of the second movement. It is known one of the best among 106 symphonies. Many of Dvorak’s excellent pieces were composed in the US including Symphony No. 8 popularly known as [England], Cello concerto, From the New world, String quartet, and America. He visited London in 1884 at the age of 43. Since then, he visited there nine times in 12 years. Symphony No. 8 is a music to reflect his deep impression on the Great Britain. However, the music has a deep emotion of Czech, his home country and Bohemian color. Beethoven's [The Pastoral Symphony] was composed in 1808 when he was 38 years old and was premiered in Theater an der Wien in Vienna on the 22th of December 1808. He once had a rest in Heiligenstadt near Vienna in 1802 for his ear trouble, where he wrote a will for the despair of his illness. He completed [the Pastoral Symphony] in 1808 when he visited there again. Beethoven named the symphony as the reflection of pastoral life. He let people freely interpret the music. Such was clearly shown in his expression that "it was an expression of emotion rather than of painting". It was one the most popular symphonies along with No. 5 and No. 9. This is the prelude of Mozart's "Magic Flute", one of his greatest operas. He composed it at the age of 35. At that time, he was a man of fame as a royal composer, but was very poor financially. Thus, he had no choice but to compose popular music such as dance music to make money. In such circumstances, he was requested to compose an opera by Schikaneder, one of popular producers in Vienna. He started composing from May 1791 and completed the final prelude on the 28th of September. The opera was premiered under his baton in Vienna on the 30th of September 1791 at the suburban Freihaus-Theater auf der Wieden. It had a great success since November. There was a rumor that its success saved Schikaneder from his bankruptcy. Despite many contradictory plots thanks to the change of scenario, Mozart's excellent music created an ever best masterpiece. [Fantaisie Brillante sur Carmen] is one of variations composed by François Borne on the basis of Bizet's opera (1875). It consists of three chapters. In chapter one, piano begins the play with the prelude of solders waiting for Carmen. It is followed by Flute playing Seguidilla that Carmen sings, and followed by the prelude of the act 4 and the main of Micaëla with long and splendid variations. The first chapter finishes here. In the second chapter, the first piano is played again followed by three variations of the habanera. At the last part, there is a variable changing the song of the gypsy dramatically in the second act of the opera. It is finished with a short coda by the composer after a short appearance of a chorus of bullfighters. This is a splendid solo for flute which shows a dramatic and wonderful charm of a solo flute with instrumental accompaniment of the FEA Flute Orchestra. [A Night on Bald Mountain] by Mussorgsky, one of the Russian composers known as the Five, is very unique and outstanding in the 19th century orchestral music. It was arranged as orchestral music by Rimsky Korsakov after Mussorgsky died. In 1886 it was premiered under the conduction of Rimsky Korsakov. The title was inspired by the orchestral music 'St. John's Night on the Bare Mountain' completed by Mussorgsky in 1867. Russian legend tells of a witches' sabbath taking place on the eve of St. John's Night on the mountain of Kiev in southern Russia. The music was inspired by such legend. Opera [Nabucco] is the third opera of Verdi and gave a huge fame to Verdi. Verdi was in deep despair by the failure of opera Merelli of Scala theatre gave him 'An Italian Solera' an opera version script based on the history of Nabucco. At first he refused, but started to compose by the constant persuasion of Merelli. North Italian of that time was full of patriotic movement for unification of the country. The nationalism and willingness for free will attracted Verdi who read the script of [Nabucco]. He completed the composition at the end of 1841. An Italian poet Carducci hailed it as 'the first throbbings of his youthful art Giuseppe Verdi'. The FEA Flute Orchestra is a representing organization of flautists. The FEA is an extensive association of leading flautists, and flute instructors in the university and college, the elementary and secondary school, the private music school and the culture center. The FEA holds academic seminars and studies on flute play and instruction and endeavors to expand network of flautists. Training and education programs to develop skill as flautists and instructors are being given. 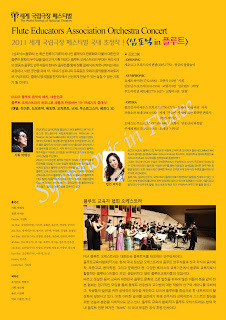 The FEA Flute Orchestra is the sole official sponsor of ‘flute&’ the only flute specialized magazine in Korea. The FEA Flute Orchestra provides a different feeling of harmony from the current orchestra. It endeavors to develop not only classic orchestration, but also to link choir, band and traditional music to the flute orchestra. 피아노의 가장 높은 음역을 넘어서는 피콜로에서부터 소프라노, 알토, 베이스, 콘트라베이스 플루트 등의 다양한 음역군을 가진 플루트는 단일 악기군만으로도 훌륭한 오케스트라 구성이 가능한 악기이다. 수준 높은 전문성과 다양한 장르를 아우르는 차별화 된 활동으로서 플루트 오케스트라의 선도적인 역할을 하고 있는 는 이번 무대를 위해서 관객들로부터 큰 사랑을 받고 있는 대표적인 교향곡과 오페라 명곡들을 레퍼토리로 선별하였다. 오케스트라로 감상하던 18, 19세기 클래식의 감동을 새로운 느낌으로 전달하게 된다. ■ 기획의도 <심포닉 in 플루트>는 최근 한류의 지류의 하나인 클래식의 한류화와 더불어 대한민국 플루트 문화의 우수성을 알리고자 기획 하였다. 플루트 오케스트라의 무대는 우리시대의 청중과 플루트 연주자들이 현대식 플루트를 통해 정통 클래식과 커뮤니케이션하는 과정이다. 이번 공연을 위해 18, 19세기 심포니와 주옥같은 오페라 음악들을 레퍼토리로 구성하였다. 클래식 명곡들을 한자리에서 신선하게 만날 수 있는 놓칠 수 없는 기회가 될 것이다. ■ 제작방향 및 예술 콘셉트 아시아 플루트 음악의 메카로 떠오른 대한민국. 플루트 오케스트라의 하모니로 새롭게 탄생하는 18, 19세기의 클래식! 이 무대에서는 대중들로부터 큰 사랑을 받는 18-19세기의 교향곡과 주옥같은 오페라 명곡들로 짜인 레퍼토리를 선보인다. 플루트만으로 구성된 오케스트레이션은 관객들에게 원곡의 감동을 새로운 느낌으로 전달하게 될 것이다. 한양대학교 음악대학을 졸업하고 현대 플루트의 본가인 프랑스의 젠느빌리에 국립음악원(Ecole Nationale de Musique de Gennevilliers)에서 최고연주자 과정을 마쳤다. 해마다 독주회와 앙상블 공연을 통하여 관객들을 만나는 것은 물론 플루트의 역사와 다양한 이야기를 담은 음악세미나로 플루트를 전파하고, 세계 유수의 오케스트라의 플루트 독주자들과 저명한 교수들을 우리무대로 초청하여 관객들과의 만남을 주선했다. 2002년 그가 창간한 플루트 전문지 “flute&“은 한국의 플루트문화를 조망할 수 있는 유일한 통로로서 한국은 물론 전 세계의 음악과 플루트 관계자의 주목을 받고 있다. 플루트 오케스트라의 대중화에도 앞장서, 지휘자이자 음악감독으로서 FEA 플루트오케스트라, 서울모이즈플루트콰이어, 밀레니엄플루트콰이어를 이끌고 있으며, 예술가들의 모임 Art Space 'the Musici'의 음악감독으로 활동하며 많은 이들과 음악의 아름다움을 공유하고 있다. 건국대학교 음악교육과를 졸업하고 이화여자대학교 대학원에서 문화예술행정을 공부하였다. 플루트를 베이스로 한 다양한 분야와의 접목, 그리고 열린 방식의 커뮤니케이션에 큰 관심을 갖고 있다. 현재 플루트하우스에서 기획과 프로젝트 매니저를 담당하고 있다. "<심포닉 in 플루트>는 클래식의 한류화와 더불어 대한민국 플루트 문화의 우수성을 알리고자 기획 하였다. 플루트 오케스트라의 무대는 우리시대의 청중과 플루트 연주자들이 현대식 플루트를 통해 정통 클래식과 커뮤니케이션하는 과정이다. 이번 공연을 위해 18-19세기 심포니와 주옥같은 오페라 음악들을 레퍼토리로 구성하였다. 클래식 명곡들을 한자리에서 신선하게 만날 수 있는 놓칠 수 없는 기회가 될 것이다." 최고의 퍼포머, 플루티스트 박지은은 예원학교 재학 중 도미하여 줄리어드(Juilliard) 예비학교와 맨하튼 음대(Manhattan School of Music) 학사학위, 예일대학교 음악대학원(Yale School of Music) 석사학위를 장학생으로 졸업하였다. 그녀는 국내 뿐 아니라 수많은 국제콩쿠르에서 우승하였고, 다수의 독주회와 국내외 유수 오케스트라와의 협연 등 수많은 연주를 통해 역동성과 섬세함을 겸비한 연주자란 호평을 받았다. 또한 개성이 담긴 명쾌한 해석은 연주효과에 있어 타의 추종을 불허하는 연주자로 각인되었다. 솔리스트, 실내악 연주자, 오케스트라 플레이어로 다방면에서 활동을 전개하고 있는 그녀는 현재 한양대에 출강하여 후학 양성에도 힘쓰고 있으며 정명훈이 이끄는 서울시립교향악단의 수석주자로 활동, 국내 최초의 목관 악기 YAMAHA ARTIST로 활동 중이다. FEA 플루트 오케스트라는 대한민국 플루트계를 대표하는 연주단체이다. 플루트교육자협회(FEA)는 현재 국내 정상급 오케스트라의 플루트 연주자들과 전국 각지의 음악대학, 초중고교, 음악학원, 그리고 문화센터 등, 다양한 베이스의 교육기관에서 플루트 교육자로서 활동하는 플루티스트들이 모인, 광범위하고 열린 플루트교육자들의 모임이다. 바르고 성실한 음악 교육과 대한민국 플루트 문화의 고른 발전을 위하여 많은 이들이 뜻을 같이 한 본 협회는 정기적인 모임을 통해 플루트 연주법과 교수법에 대한 학술적 연구와 세미나를 주최하고, 학생들의 발전을 위한 실제적인 방안을 제안하고 있으며 플루트를 중심으로 한 네트워크의 활성화에 앞장서고 있다. 또한 이러한 결과를 실천하기 위해 연주자와 교육자로서 스스로의 향상을 위한 연습과 훈련을 자체적으로 갖고 있다. 플루트 교육자 협회(FEA 플루트 오케스트라)는 현재 국내 플루트 전문 매거진 “flute&” 의 국내 유일한 공식 후원 단체이다. FEA 플루트 오케스트라는 기존 오케스트라로 감상하던 음악들을 새로운 색깔의 멋진 화음으로 선사한다. FEA 플루트 오케스트라는 첫 출범부터 꾸준히 기존 오케스트라의 클래식 오케스트레이션은 물론 합창, 밴드, 민속음악의 형태 등을 플루트 오케스트라에 접목시키는 작업을 해 오고 있다.